Ubicomp/ISWC 2018 will be held from 8th October 2018 to 12th October 2018 at the Suntec Convention Center, Singapore. Suntec Singapore is the World’s Leading Meetings and Conference Centre, located at the heart of Asia's most integrated meetings, conventions and exhibitions hub. With 42,000 m2 of flexible customisable space, free WiFi, a digital signage network, an excellent range of culinary choices and a dedicated team of service experts, this award-winning Centre caters to events from 10 to 10,000 persons. With a high degree of digitalization, Suntec Singapore has an innovative edge in always delivering a seamless customized experience for its customers. The main conference program will then occur on Tuesday, October 9 – Thursday, October 11. Registration is now open. More information about how to register for ISWC 2017 can be found here. Changi Airport (IATA: SIN) is the primary airport for Singapore where all the international flights will arrive and depart. Changi Airport serves more than 100 airlines flying to some 320 cities in about 80 countries and territories worldwide. The airport is located in the village of Changi, at the eastern end of Singapore, approximately 17.2 kilometres (10.7 mi) northeast from downtown Singapore. Taxi: The simple and easiest way to the conference venue/hotels is to take a taxi. It takes 20-25 minutes, and regular taxi costs about 20-25 USD depending on the time of arrival. You can easily grab a taxi 24/7, and no prior booking is required. Other inexpensive options (about 2 USD one-way) using public transportations. Take the green line at Changi Airport station (accessible by foot from terminal 2 or terminal 3). Transfer to the westbound train at Tanah Merah station. Get off at Paya Lebar station, and transfer to the yellow line bound to Dhoby Ghaut station. Get off at Esplanade station (Exit A). The station is connected to the Suntec convention center. The total travel time will be about 1 hour. Trains operate quite frequently (every 5-10 minutes). Also, all the trains and gantries at the stations are luggage-friendly. For those who arrive at late night, the last train that connects to the city leaves Changi Airport station at 11.18pm. Bus (No. 36): Take Bus No. 36 (from any airport terminal). 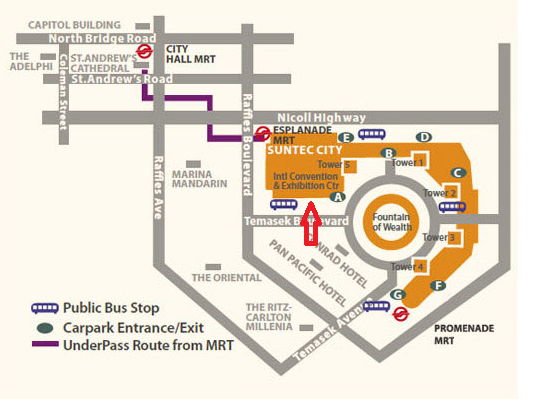 This will take you to Suntec Singapore directly. The 36 buses operate every 10 minutes, and it takes about 50 minutes (may differ depending on traffic). Buses are also luggage-friendly. Note: Rental car is the least preferred option to travel around Singapore. Taxis are affordable, and almost every parts of the city are well connected by buses and metros. For those who need a visa to travel to Singapore, you can find more information at https://www.ica.gov.sg/enteranddeparting/before/entryvisa. Those requesting a letter should allow up to one week to receive it, as requests are handled in the order they are received. Please note visa support letters are issued via email by PDF, and the email will be sent to the email address that you used to make your request.